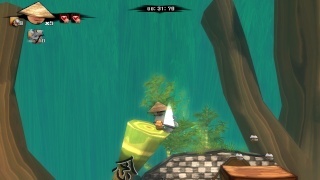 Wooden Sen'SeY is an impressive platforming title published by Neko Entertainment and developed by Upper Byte that features plenty of eastern charm and can be challenging at times "especially the time trials stages"! You must traverse over 9 main stages that start off easy, but quickly became quite difficult. The enemies range from stationary black blobs, to quick moving spiders and flying bats and will prove to be a challenge during the mid-stage battle found in each stage which pits you against many enemies simultaneously. 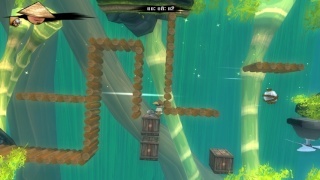 The platforming itself is for the most part easy, but can be really difficult during the tougher time trials stages. The game's main mode is short and will likely take no more than 2 hours to finish, but the time trials stages, while short are extremely challenging and number in the dozens which increases the replay value of the game greatly! On top of the platforming stages there's a handful of underwater stages that you must navigate a submarine and avoid enemies while destroying obstacles with missiles! All in all these varied stages add a layer of uniqueness to this highly enjoyable title! The controls are also very easy to learn which is a serious plus and the Off-TV Play is nearly flawless! Wooden Sen'SeY has Japanese inspired stages which look absolutely breathtaking and the character models and enemy designs are quite unique as well! The lighting effects look amazing and the water glistens as cherry blossoms blow in the wind, it all goes together nicely and looks gorgeous! The music is also perfect for this game as Japanese instruments are used generously adding to the eastern style the game aims for! Overall the audio-visual aspects of the game are incredible! With amazing gameplay, smooth controls, and incredible visuals and music Wooden Sen'SeY is a game no Wii U owner should be without! The time trials are also extremely polished and enjoyable as well! All in all we highly recommend this amazing Wii U eshop title! The art direction of this game is truly beautiful. Good review. I might download this one. I always do my homework on games I'm up on the air on and I'm not trying to be rude but your score is almost 2 points higher then the highest score on Metacritic. Now while I'm sure this is your play thru experience I'll have to wait on a sale before I would even consider this. This game does however look good and holds an interest for me so I'll keep a look out for it but it will fall below quite a few other games I personally think will be better for me. Otherwise it was a good review. @Tech101 wrote: I always do my homework on games I'm up on the air on and I'm not trying to be rude but your score is almost 2 points higher then the highest score on Metacritic. Now while I'm sure this is your play thru experience I'll have to wait on a sale before I would even consider this. It's just my opinion, and I completely respect yours. I appreciate your constructive criticism so thank you very much.